It is my intention in this paper to set out the criteria for a new treatment for trematode infestation, this will be a new slant on an existing chemical for the treatment of skin and gill flukes in koi (carp) A series of trials have been accomplished to set a standard for this treatment. My thanks to Jackie Brown for her considered opinions, ideas and support not to mention the countless donated koi for experimentation, and last but not least her friendship. My thanks also to my friend Spike Cover, all knowing, all-seeing, sage, soothsayer, and former javaline catcher for the 1986 Olympics. Seriously, my thanks to my friends, Spike, Roddy and Roark who's undying passion for helping the hobby of koi keeping, inspired me to this project. The hobby of keeping koi is plagued by many diseases and parasites, none more fearful to the hobbyist than skin fluke (gyrodactylus) and gill fluke (dactylogyrus) The purpose of the following trials is to try and establish a further treatment protocol that is more accessible to the average hobbyist than Supaverm or levacide. For quite some time now these two products have been in use by the top end koi hobbyist to eradicate trematode infection (flukes). For this purpose, it is generally accepted that Supaverm or levacide are the ultimate treatment for fluke, needing no repeat dosage. However, these two products are controlled substances and NOT readily available to the general public or the average hobbyist. It had therefore been my quest to find a viable alternative. Supaverm is made by a company called JANSSEN, it contains Mebendazole @ 75 mg/ml and Closantel @ 50 mg/ml, and is in suspension in a liquid form to serve as an oral sheep drench. Mebendazole belongs to a select group of chemicals, which includes Levamisole and Flubendazol, all of which are commonly found in typical wormers for livestock. After doing some research into wormers, I discovered another product from JANSSEN called TELMIN, an oral equine wormer. TELMIN contains Mebendazole @ 100mg/g in granular form, the same active ingredient as in Supaverm, but TELMIN is readily available over most counters at big livestock/pet supply outlets. It was thought that TELMIN would be a suitable alternative to Supaverm if it could be proved to be as effective as Supaverm in destroying trematodes. 1. If Telmin is indeed capable of eradicating trematode infection. 2. Telmin's short and long term effect on koi health. 3. Telmin's effect upon the biomass of a filter system. 6. Finally to establish a safe administration protocol. Supplies of Telmin had been obtained and approximately 8 koi of small sizes infected with flukes, a filtered quarantine system (156 gallons) has been set up and running for approximately two weeks in readiness for the onset of trials. No ultra violet lighting. Unfortunately there is a slight ammonia reading as the filter was not yet settled, but as after each test the tank will have to be emptied to void the system of TELMIN for the next trial and the ammonia reading is thought to be of no consequence at this initial stage of the test, for reasons that will become apparent in due course. 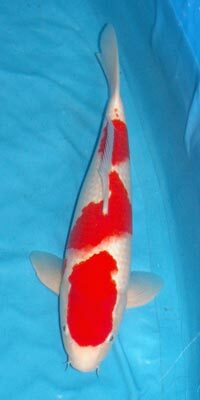 A white koi of no discernible bloodline, 5/6" in length is the first study case. This koi is infected with substantial numbers of flukes and just a very small percentage of these are gill fluke. The subject is also suffering from dropsy and it was thought that any recovery from dropsy for this fish was unlikely. It was therefore, decided to use this particular koi initially, as a test to see if TELMIN would indeed do what it was thought it would, i.e. eradicate flukes. No thoughts at this time will be accredited to the survival of the subject, indeed, there would be no meaningful data to gather from the death of the subject either, as it could not be determined what the cause of death was, dropsy or toxicity of TELMIN or both. Approximately 1.2gm of TELMIN = 120 mg of Mebendazole was added to the tank which contained the trial 1 koi at 6 pm on 13.03.01. *This dose is equivalent of 1.5 gm Telmin per 200 UK gallons* This mg of TELMIN is an approximate dosage as used with Supaverm as a starting point. The trial was looking to achieve a dose rate of approximately 0.75mg of Mebendazole per 100 imp gallons. This was achieved by gram weighing the Telmin and dissolving it in a little boiling tap water and spreading around the edges of the tank. As previously mentioned, the tank water temperature is approx 12 c and should be an ideal starting point as there is no known lower limit for the application of its sister product Supaverm. It is hoped that the subject will live long enough to allow examination for flukes, after a suitable time period for the product to work; this is in no way assured because of the dropsy affecting the test subject. If death of the subject occurs before examination, no meaningful data can be obtained from a dead specimen, as toxins produced by the corpse will very quickly make the parasites evacuate the host. A suitable time period based on how supaverm performs would be 24/48 hours. The first examination has been of great interest and quite fascinating with a newly acquired, more powerful microscope enabling a higher magnification and a clearer picture into the inner workings of the ectoparasites. Exactly 24 hours into the trial, two mucus scrape samples were obtained from the test subject, which at this time was still alive. These were microscopically examined and the following observations noted; 24 hours into the test a reduction in flukes was observed, but there were still substantial flukes present. However, upon further examination more than 50% of these were not very motile with a further 50% of this sample showing no signs of movement at all. This was at x 150 magnifications. The magnification was increased to x400 and further discoveries were made. Clear indications of breakdown in the cell walls of some of the parasites were noted. On one particular Gyrodactylus an embryonic unborn erupted exactly half way down the trunk of the fluke through the side of the cell wall, with no sign of life in the adult or embryo. Upon going to x1000 magnification, a clearer picture showed the inside workings of the fluke, it was noted that the metabolism of the fluke appeared to be winding down, not showing much activity. Somewhere between 24 and 48 hours the test objectives were achieved. The test subject was again examined by mucus scrapes and four samples where obtained, plus two gill samples, the subject was then euthanased. The gill samples were placed under the microscope at x150 magnification and no fluke's were evident. The examination was repeated at x400 and again the gill samples were clear. Upon examination of the four mucus samples only two flukes were discovered, one dead and misshaped, and one which looked dead, but upon higher magnification X 400 there was seen to be a very slight movement inside a badly disfigured shape. Upon increasing the magnification to x 1000 it was noticed that the cell wall had, indeed, been breeched at about the mid point of the trunk. And it seemed that this was the reason the fluke could not maintain shape. Conclusions of the first trial It seems that the first trial of Telmin did indeed prove very able to eradicate fluke, and judging by the first samples that were examined before treatment began, it is my best estimate, that assuming a small percentage of living flukes may have been missed upon the last examination, Telmin achieved at least a 95% kill rate of trematode, this figure may be higher as the assumed possible 5% missed observations of fluke is always going to be an unknown factor. It appears that the elimination of fluke occurred somewhere in between the 24/48 hour mark as expected based on experience of Supaverm. Next trial. The next trial will be set up in the next two to three days and the purpose of this trial will be to repeat the success of the first trial. Furthermore, to try and establish if any harm is done to the well being of the subject (koi). Telmin will be added to the treatment vat over four hours to simulate what is current practise with Supaverm. The subject will not be examined, after the initial examination to establish numbers of flukes prior to treatment, until 48 hours have elapsed, as we now have a time scale to work from. Further, the water parameters will be as near perfect as possible with no trace of ammonia Other parameters will be as before. B, to further determine the effects on the koi's health, It was therefore decided that two-test subject's would show a bigger picture. The dose of Telmin was administered commencing 6.00pm on the above date, and the dose rate the same as the previous trial. 24 Hours into the test study subjects are looking quite happy and swimming in a quite normal fashion, and indeed are showing no signs of stress or redness. Two test mucus samples were taken from the subject that was scraped before treatment began, the other subject was left alone so as not to cause further stress to this fish, as this test is to establish the effects on the health of the koi also. Upon examination the two samples showed approximately 17 flukes left, of these 17 about 30% showed very little body visible, just the two prime haptor hooks, another 30% were very disfigured, looping like a rope with knots tied in it, with parts of the cell wall not visible under x400 magnification. The remainder of the flukes had some movement, although not resembling a typical fluke-like shape. It seems that this test also repeated the success of the first trial although more flukes were visible. But this particular subject displayed 162 flukes under the microscope prior to treatment, so it would seem that a better than 95% kill rate was achieved yet again But at some time during the test the water temperature dropped quite dramatically to 5c and it was felt this could have slowed the treatment down. The two test subjects were again examined after seven days of treatment, they were alive and well, no signs of stress or post-opportunist infection after being treated with Telmin, and the test subjects were not subject to any partial water changes, as the worst-case scenario was required for evaluation. Two mucus samples were obtained from each fish for microscopic examination and the results were conclusive; no flukes at all were noted. As expected, Trichodina was still in evidence but Mebendazole does not eradicate Trichodina. The two test subjects were placed back in the main q-pond, where they will remain for further study. The two initial tests have proved that Telmin is indeed capable of fluke eradication on a scale similar to that of Supaverm, and the trials have so far confirmed that the koi suffers no ill effects during or after treatment. B. To determine an upper dose rate before damage to the koi occurs. E, To establish the effects on other species of aquatic life, in particular goldfish (see note below) Note: it might be the case that Mebendazole is not the active ingredient in Supaverm, which damages goldfish. As Telmin contains no Closantel, and Supaverm does. Test " 5" will establish if this theory is fact or fiction. Test three has now been set up and is a validation test, this will commence on Saturday 31:03:01 With two new test subjects, these test subjects will be left in the treatment tank for one week with Telmin added at the above dose 1.2 gm of Telmin = to 75mg of Mebendazole per 100 imp gallons. This test is to purely to validate and back up the findings of the prior tests before proceeding further, as test four will try and establish an upper treatment dosage. Test three terminated 9 days after the 31.03.01 . The microscope showed only one skin fluke and the test subjects were not showing any signs of stress or ill health and have been back in the main quarantine pond for a further week and are exhibiting normal behaviour and feeding patterns. This third test was deemed a success. The purpose of test four is to establish the upper dose limit, e.g. the point at which Telmin begins to affect the well being of the koi. Test four commenced on 15.04.01. The two koi used in this test were also infected with a substantial number of flukes and have been subjected to 100 mg of Mebendazole per 100 (imp) gallons, as before no partial water changes will take place during the trial, which will last for the next seven days. This will give a worst-case scenario. It was deemed viable to end this particular test after nearly one month, as no detrimental effects on the well being of the test subjects, were being observed, in fact, the two koi look in very good health. After a lengthy break trial five was set up on Saturday the 22nd of September 2001. This is hopefully to be the last of the trials prior to publication of this document. This trial was set up with three goldfish in the 156-gallon system to establish if Mebendazole is toxic to goldfish. As mentioned previously Supaverm is toxic to goldfish but it has never been established if it is the Mebedazole element in Supaverm that is the root cause of the damage to said species or the closantel .as Telmin contains only Mebendazole we should be able to ascertain which element is responsible for the destruction of goldfish or maybe a combination of the two. 1,Telmin is more than capable of trematode eradication with no ill effect on the koi. 3, a safe margin of error in dose rate has also been established. 4, a method of administration of the product to the pond system. 5, Telmin is capable of working down in temperature as low as 5c (as proven in trial two) whilst not being desirable to do a treatment of any description at this low temperature, it was a case in point that Telmin could perform at these low temperatures. 7, No upset in bio function of the filter system was observed. 8, a typical set of pond parameters in order that Telmin is to function well were also established.